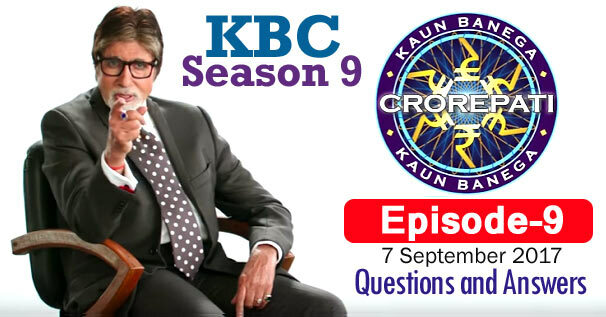 KBC Season 9 Episode 9 Questions and Answers: The ninth episode of Season 9 of Kaun Banega Crorepati (KBC) was telecast on 7th September 2017. In which Amitabh Bachchan had asked contestants 15 questions of General Knowledge. The correct answer to all the questions is given below each question. By reading these questions, you can prepare yourself for the next KBC Season 10 of Kaun Banega Crorepati. Because by reading these questions, you will understand what kind of questions asks Amitabh Bachchan in KBC. These all general knowledge questions will be helpful to for you various Competitive Examinations and Interviews besides KBC. Remember, the answer to some question may be in accordance with that time, while the answer to those question may differ according to the present time. 1. Which hunter eventually shot the Champawat tiger, a female that was reputed to be responsible for more than 400 human deaths ? 2. Located in Maharashtra, what is the name of the ancestral village of the prime minister of Ireland who took office in June 2017 ? 3. Arrange the following in increasing order of their duration. 4. Which of these is a type of salt ? 5. According to the title of a Yash Chopra- Shah Rukh Khan film, what is 'dil' ? 6. Pukhraj, Maanikya and Gomed are types of what ? 7. Which of these is a type of disease caused by the deficiency of Vitamin A ? 8. On which film starts is song picturised ? 9. Gharial gets its name from a distinctive shape at the end of the snout of their males that resembles which one of these articles ? 10. The chief minister of which of these Indian states is also fondly known by the name Mama ? 11. Bezwada Wilson received the 2016 Ramon Magsaysay award for fighting against which social evil ? 13. According to a Hindi idiom, making a mountain out of which of these spices means to make an issue of small things ? 14. Which character in the TV series 'Bhabiji Ghar Par Hain' often uses the catchphrase 'Sahi Pakde Hain' ? 15. On which of these documents would you find the MICR and IFSC codes ?